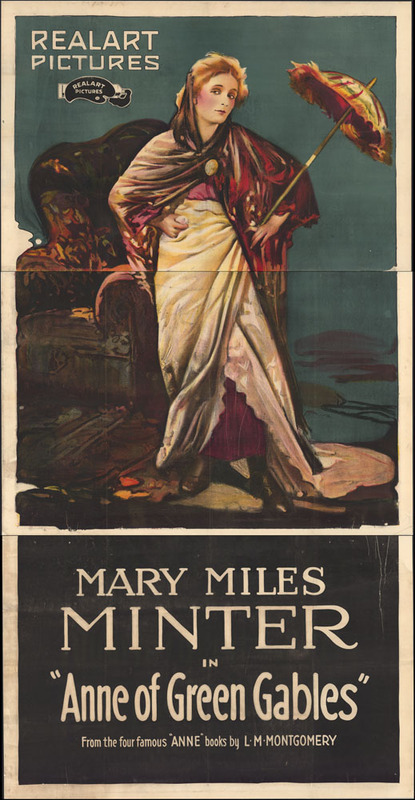 A colour lithograph poster of actor Mary Miles Minter in Anne of Green Gables from Realart Pictures, 1919 (AMICUS 27641454). “Anne of Green Gables” is a trademark and a Canadian official mark of the Anne of Green Gables Licensing Authority Inc.
You may not have recognized Lucy Maud Montgomery’s red-haired heroine from this American movie poster. It presents one of the earliest mass-produced images of “Anne.” She has since become a regulated symbol of Canada. 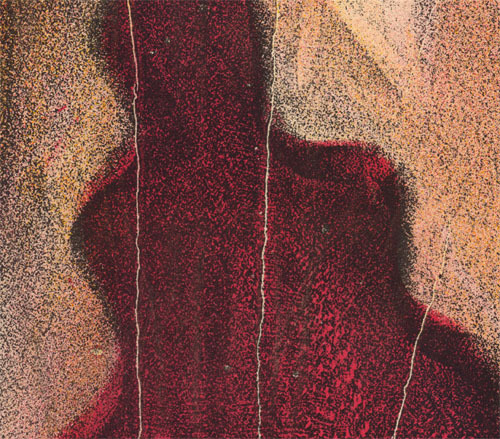 My curiosity about artists’ materials and techniques has taken my research in many directions, from the pastels of Edgar Degas and other 19th-century artists to the complex printmaking techniques of Canadian artist Betty Goodwin. I have been practicing paper conservation for over 30 years, treating everything from Old Master prints to huge contemporary drawings. As well, I have a special love for weaving, playing the cello, and oversized paper artefacts that present great challenges in treatment and mounting. Our poster of Anne of Green Gables is rare. Like newspapers, movie posters are ephemeral objects that are not intended to have a long lifespan. These types of objects are usually printed on poor quality papers that were never meant to withstand the ravages of time, which makes the survival of our Anne of Green Gables poster so special. Figure 1. Three separate sections of the Anne of Green Gables poster (AMICUS 27641454). “Anne of Green Gables” is a trademark and a Canadian official mark of the Anne of Green Gables Licensing Authority Inc. This 1919 poster was made with a process called lithography, a common printing method used at the turn of the century to mass-produce commercial products like posters, maps, advertisements and packaging. Lithography was invented in 1799 by Alois Senefelder and named for the limestone printing surface, from the Greek lithos, meaning “stone.” It became a popular and inexpensive way to create colourful, luminous images by the late 19th century. Unlike other printmaking processes, lithography is based on a chemical principle: oil and water do not mix. To make a lithographic image, the artist draws directly on the specially treated stone surface. A chemical process makes the greasy drawing receptive to the greasy printing ink, while the non-image areas are kept wet to repel the ink. Because of its size, our poster was drawn on three separate stones and printed on three pieces of paper (Figure 1). 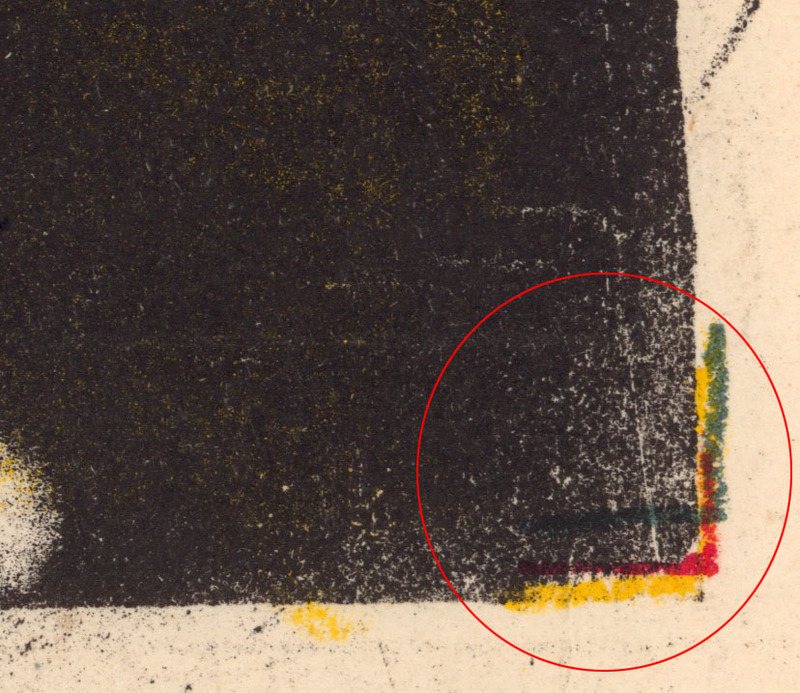 Looking at the sides of the image, we can see the irregular edges of the lithographic stones (Figure 2). The thin white lines throughout the image are printing creases. The thinness and size of the paper make it difficult to place the sheets smoothly on the stone, hence the fine wrinkles that open after the ink is dry, leaving these characteristic white marks (Figure 3). 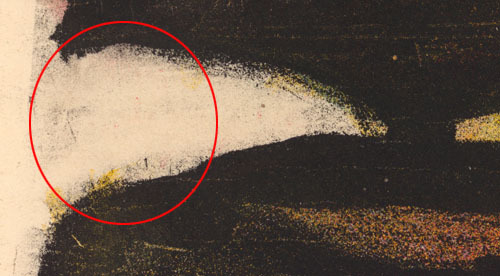 In this detail, we can see that the artist used a greasy crayon to draw the image on the lithographic stone, and also applied the greasy ink in a fine spray. Colours are added by using additional stones that are printed in overlapping transparent inks (Figure 4). Special registration marks help guide the printer as each consecutive stone is printed (Figure 5). Only four overlapping colours (red, yellow, blue and black) were used to produce this colourful image of Anne of Green Gables! Figure 4. 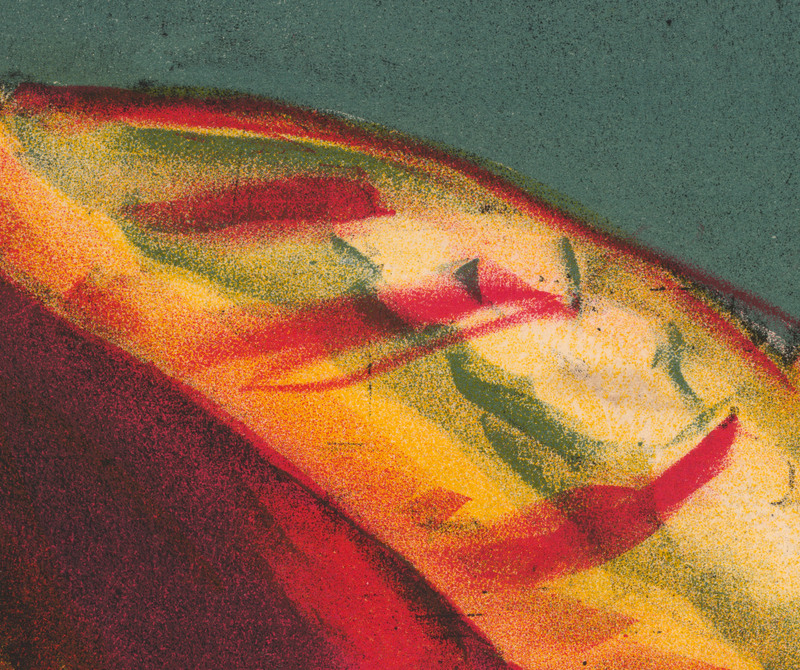 Detail of overlapping, transparent colours. The Dionne Quintuplets come to mind as another example of celebrated Canadian icons (Figures 6, 7). In 1934, the “Quints” became international celebrities as the first documented surviving multiple-birth infants. In their early years, they were the subject of three feature films and drew tourist crowds to their small town in northern Ontario. 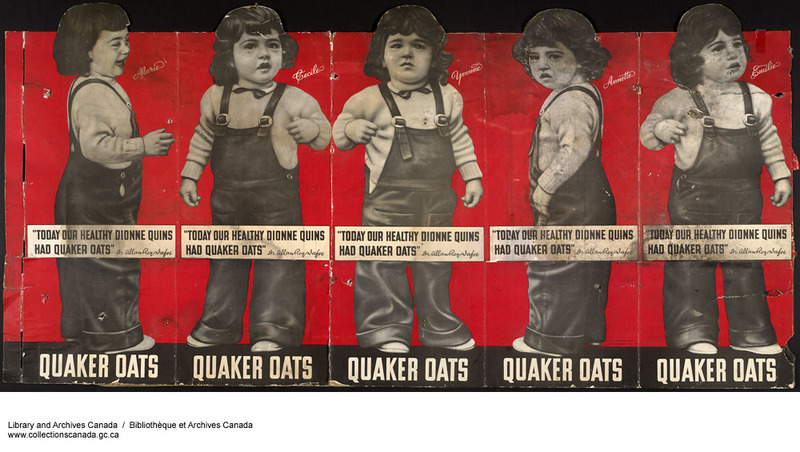 The Quints provided lucrative endorsements for many products, like Quaker Oats, featured in this poster. Like the Anne of Green Gables poster, this image of the Quints (“Quins” on the poster) was mass-produced using the lithographic printing method. The poster was intended to be used as a three-dimensional standing display and has suffered wear and tear from physical handling. It was recently conserved for an exhibition, and the treatment was kept to a minimum to preserve the evidence of its use. The poster was stabilized by repairing tears and replacing the deteriorating cardboard backing with a sturdier archival material. Damages from abrasion and use were reduced through careful toning with watercolour to make the image more readable (Figures 8, 9). Anne F. Maheux has a BA in Fine Art from the University of Guelph and received a Master’s in Art Conservation (MAC) from Queen’s University and a certificate in the conservation of works of art on paper at the Center for Conservation and Technical Studies, Harvard University Art Museums. 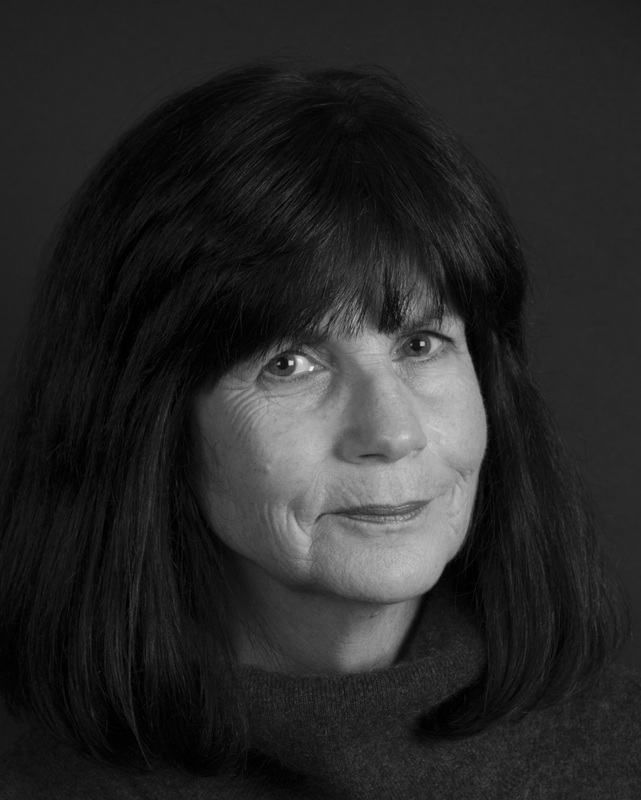 She is a recipient of the American Academy in Rome Prize in Historic Preservation and Conservation, and is an accredited member of the Canadian Association of Professional Conservators. She was Conservator of Prints and Drawings at the National Gallery of Canada for over 25 years, and is now Head, Conservation of Works on Paper, Maps and Manuscripts at LAC. Her scholarly interests include 19th-century pastel painting, particularly the work of Edgar Degas and Giuseppe De Nittis. She has published extensively on pastels, and on innovative conservation techniques and treatments. The Signing of the Proclamation of the Constitution Act, 1982, photographed by Robert Cooper in 1982. Michael Smith spearheaded an initiative to design and fabricate custom preservation storage cases for two of LAC’s most prestigious documents, both copies of the Proclamation of the Constitution Act, 1982. J. Andrew Ross is responsible for the records of the Registrar General (RG68), which is the repository for all the proclamations of the Government of Canada. 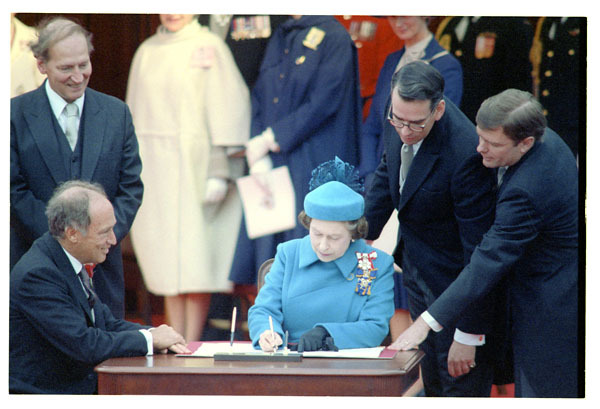 The Proclamation of the Constitution Act, 1982 was signed on the steps of the Parliament Buildings in Ottawa on April 17, 1982 by Queen Elizabeth II, Prime Minister Pierre Trudeau, Attorney General (Minister of Justice) Jean Chrétien, and Registrar General (Minister of Consumer and Corporate Affairs) André Ouellet. 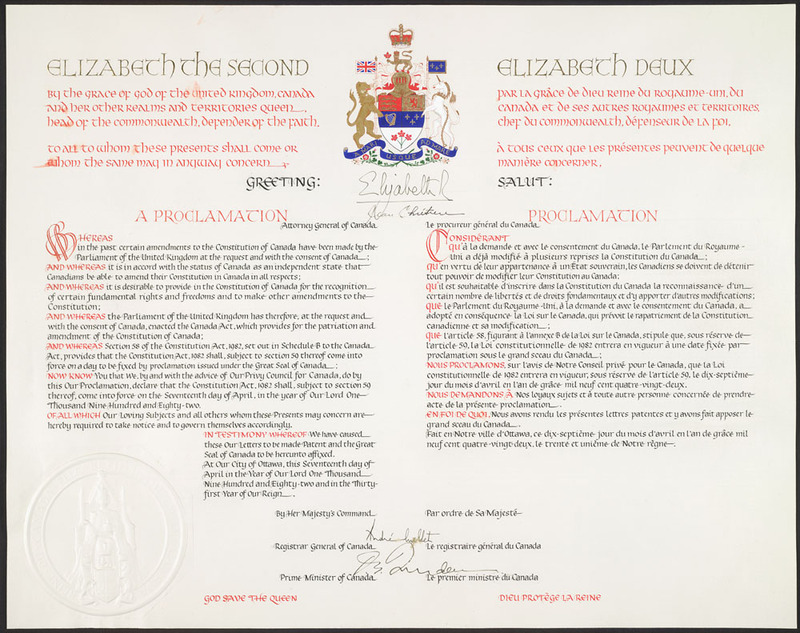 The Proclamation, which is the only Canadian foundational document signed by the monarch, brought into force the Constitution Act, 1982, amending Canada’s constitution and enacting the Canadian Charter of Rights and Freedoms. 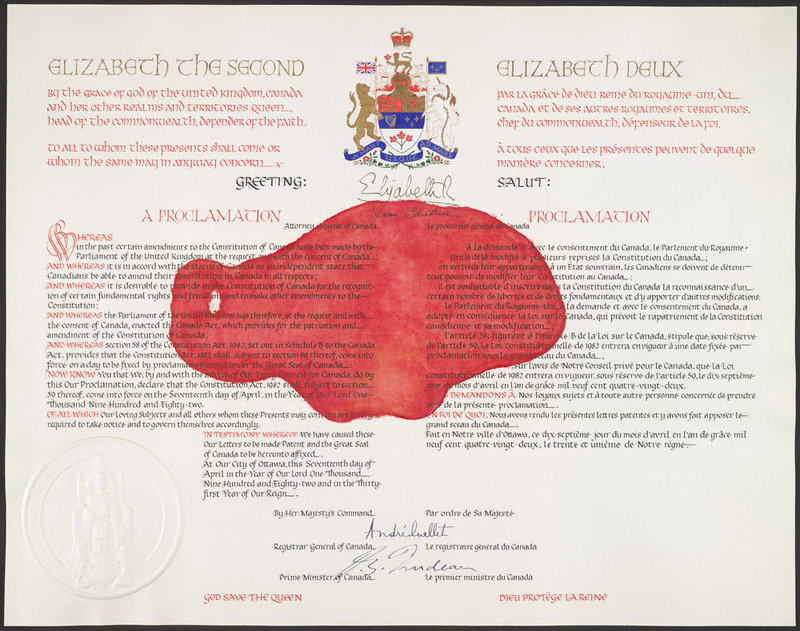 The signing followed several years of constitutional negotiations in Canada that culminated in the patriation of the Constitution, the transmission of full constitutional amendment power from the United Kingdom to Canada. 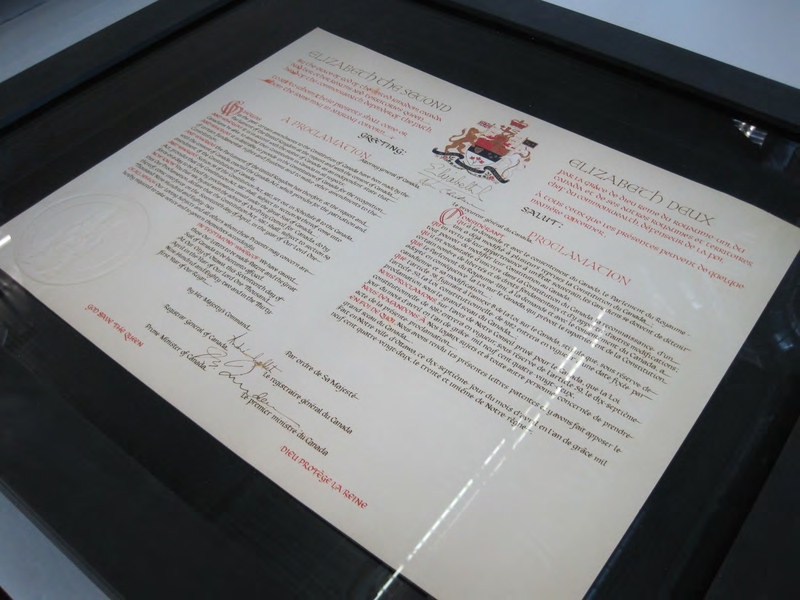 There are actually two copies of the Proclamation: the one signed outside, which suffered water damage (seen above) and became known as the “raindrop” copy, and another that was signed later inside the Parliament Buildings. Originally pristine, the latter was defaced with red paint by a protestor in 1983, and has since become known as the “stained” copy. Both copies of the Proclamation are held by LAC and have been exhibited extensively since 1982. The raindrop copy was recently on display at the Canadian Museum for Human Rights in Winnipeg and was returned to LAC in early September. In 2017 it will be on display at the Library of Parliament in Ottawa. You can watch the moment of the signing, and the Queen’s reaction here on CBC (after 7:45 minutes), or here on Radio-Canada (about 0:47 minutes). 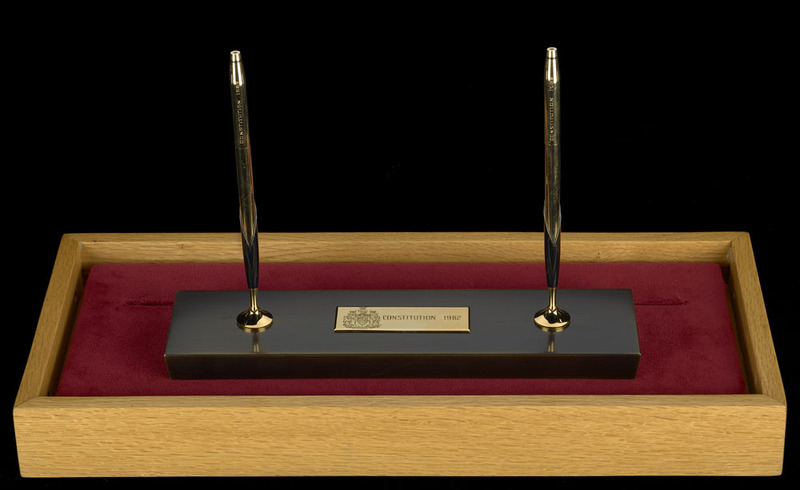 Although the pens were purchased from Birks’ Jewellers, a high-end retailer in Ottawa, apparently little thought was given to the durability of the ink, and over time the popularity of the Proclamations as exhibit items prompted concern about the fading of the signatures due to cumulative exposure to light. 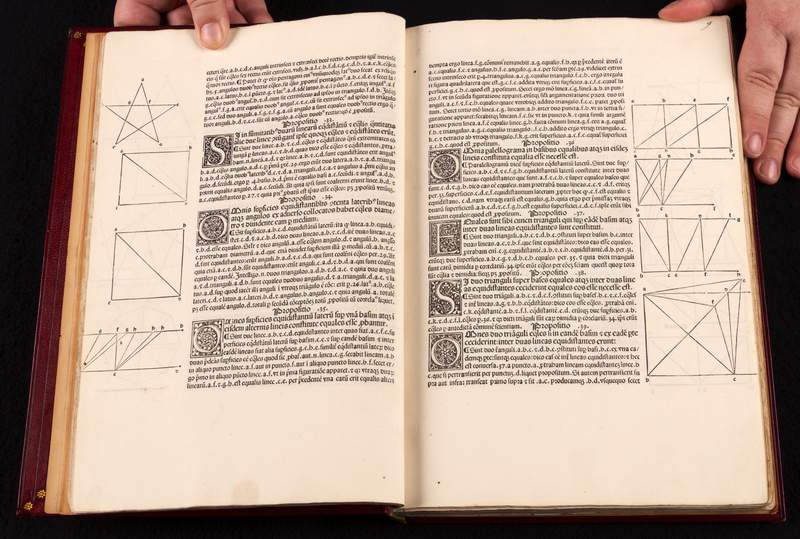 A conservative estimate of total exposure time was approximately 4,000 hours of display for each document at varying intensity levels and from different light sources. By 2011, microfade testing on the signature inks done by the Canadian Conservation Institute indicated that the synthetic dyes used in the ink are susceptible to fading, and had almost certainly done so since 1982. Fading ink has affected several important signatures on historical documents held at LAC, but while many remain on limited circulation, the importance of the Proclamations prompted a project to fabricate a custom storage case and a secure display case that would keep the documents safe from future harm. It was decided to design and construct two permanent storage cases, one for each copy of the Proclamation. 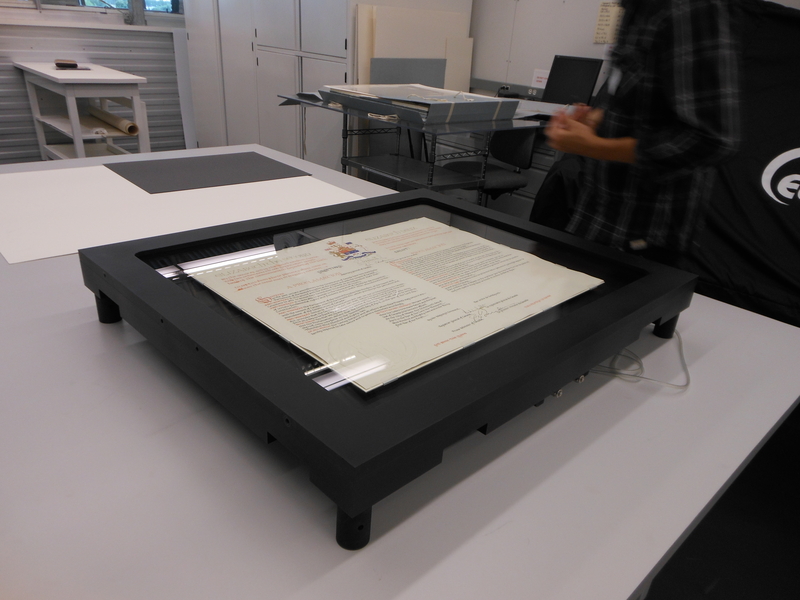 In addition, one secure display case would be made for exhibition purposes (it was anticipated that only one Proclamation would be on display at any one time.) The storage cases can be hermetically sealed to accommodate a low-oxygen environment (which might be implemented in the future to slow fading), and are glazed with UV filters and anti-reflective glass. In addition to security, the display case also incorporates features to limit and monitor light levels. With these new cases, Canadians will be able to see the Proclamations on display for years to come. Michael Smith is the Collection Manager responsible for the textual and cartographic (unbound) collection at Library and Archives Canada. J. Andrew Ross is an archivist in the Government Records Branch of Library and Archives Canada. Michael Smith, Eric Hagan, Anne Maheux & Season Tse, “A Low-Oxygen Capable Storage and Display Case for the Proclamation of the Constitution Act,” Book and Paper Group, AIC/CAC Conference, May 16, 2016. James Whalen, “Out, Damned Spot!” The Staining of the Proclamation of The Constitution Act, 1982,”Archivaria 61 (Spring 2006): 289–98. Virtual Museum.ca. Proclamation of the Constitution Act—Library and Archives Canada (video). 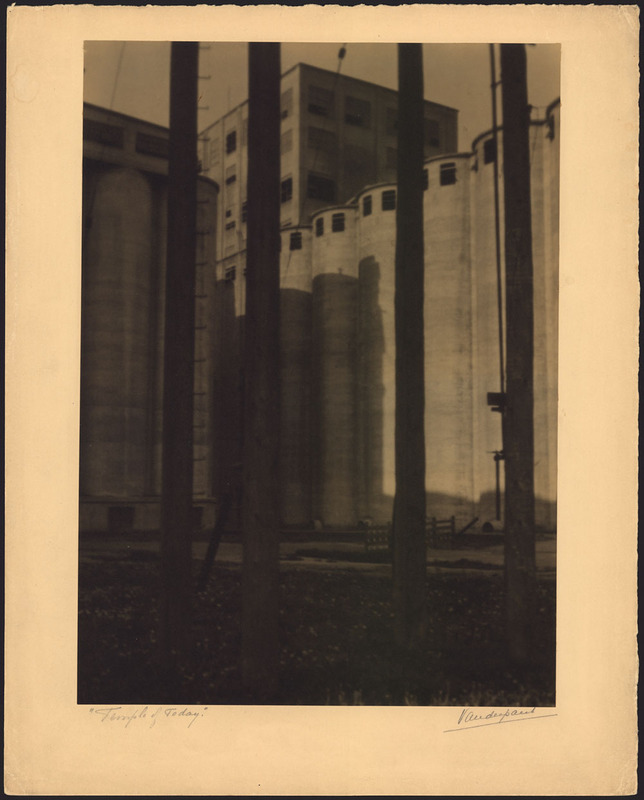 Photographer John Vanderpant saw Canada’s grain elevators as temples. They were part of his utopian vision for the country, based on a faith in trade and industry. For him, industry would define the nation’s future. I knew I wanted to be a conservator since I was 13 years old. At this time, my uncle had married a wonderful woman named Janice. She was a fine art conservator, hence she treated paintings, works of art on paper, and photographs. I was very influenced by her, and it led me to work in her private lab as I was studying at university. It provided me with experience before I even started my graduate classes in conservation. When I graduated, there was no employment in Canada, and my aunt had closed her lab and was traveling that particular year. I ended up going to the George Eastman House on a whim. It was supposed to be just for three months. Instead I stayed there three years and three months! It was when I became passionate about photography, particularly historical processes. My hands were often black due to all the silver nitrate I was playing with! And now, I see my aunt’s name on a report or two, as she had actually interned here at LAC many years before me. LAC’s collection of photographs is really diverse. You can always find a variety of processes and images. For this exhibition, I favor Temples of Today by John Vanderpant. I am a photograph conservator, so often I look beyond the image, looking deeper at the materials and how the photograph was made, or if anything has been altered. Many times, not to be distracted by the image itself, I turn the photograph around, so that the image is upside down, making it less distracting, so that I can concentrate on the material and not the image before me. But for this item, all I had to do was lean down and look at the surface of the photograph in raking light. That is when light is falling across the surface and I am almost at eye level with the surface. It is at this point you can really “see” an object; all the handling dents and deformities are really pronounced. When you do that with this item you see cat paw prints! We actually think that the cat walked one way, turned around and walked back! The photograph was already mounted on the paper support when the cat had walked on it. This is noted as one of the prints lies on both the photograph and the support. Perhaps Vanderpant had a cat who would visit him in the studio? I really enjoy finding these hidden secrets. I did try to remove or at least reduce the paw prints, but they appear to be stuck within the emulsion. So I could not do much as for treatment, and the paw prints remain. Viewing Temples of Today under raking light reveals a cat’s paw prints. Photo taken by Tom Thompson. A photograph that I enjoy showing people is a daguerreotype from July 1858. 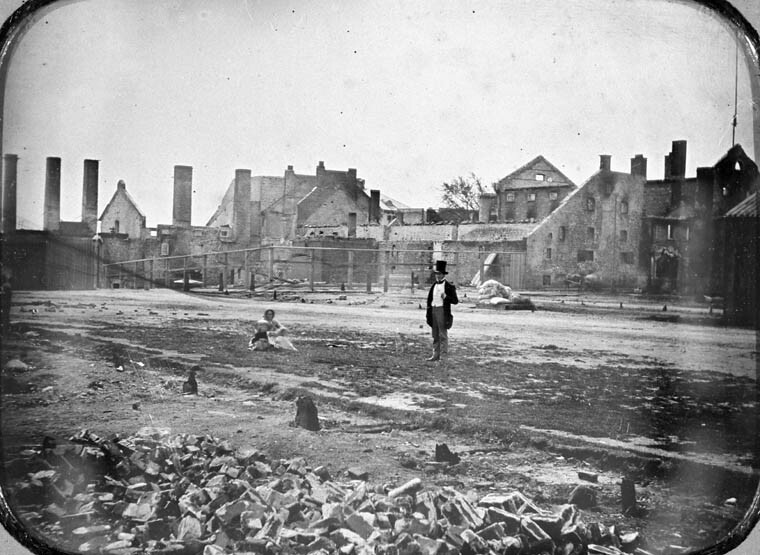 The daguerreotype has captured the Molson Brewery in Montréal, after a fire. It is a half plate in good condition. The image is sombre as the fire has left nothing. In the centre of this emptiness stands a man with a seated female to the left with a small child, who moved as the image was taken and is blurry. It is a moving image, as you can imagine that the daguerreotypist had to be physically there, at this moment to document this period of time. A few years ago, this item was going on exhibition; therefore I was fortunate enough to be able to open the daguerreotype package (the original sealing tape had been previously removed), to examine the plate. Upon removal of the brass mat, I immediately noticed in the upper left corner, a finger mark. This was hidden behind the brass mat. This fingerprint could be from the daguerreotypist, who is, at this moment still unknown. It could have been accidently placed there as he or she was developing the plate or placing it into the daguerreotype package. For me it is a sign of the mysterious past—a bridge, a connector between these people in the image and to the person behind the camera who is not visible and us, the current viewer. On this theme of animals and photography, I would like to include the “Decadog,” as we call it at the Preservation Centre. This is a perfect example of an animal being an animal. It is a nitrate panorama negative of 7th Draft, “C” Battery, Royal Canadian Horse Artillery (RCHA). These were the units of the Canadian Expeditionary Force (CEF) and the Royal Air Force who trained at various camps in Ontario; here it was in Kingston. It was taken between 1914 and 1918. The nitrate negative was discovered when my colleagues Carla Klück and Louise Perrault were scanning the nitrate panorama collection in 2011. At first glance this long negative, which is 200 mm high x 1060 mm wide, is another documented proof of military troops from the turn of the century. On closer examination, a dog appears in the foreground. But not just any dog—a dog with eleven legs! Viewers are always confused when they notice this unusual aspect. 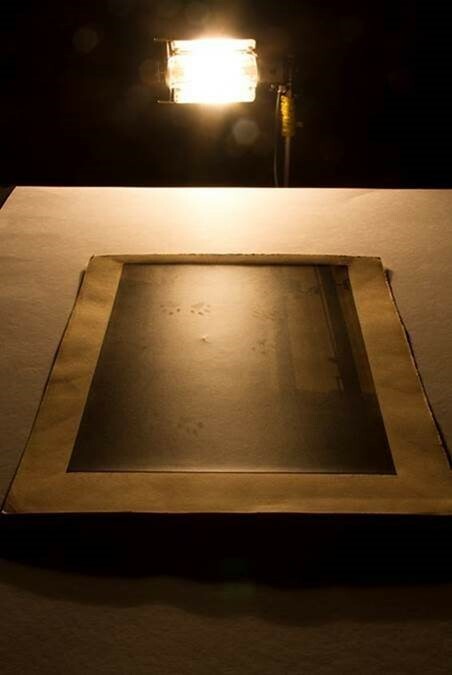 Someone has previously outlined in black ink on the negative (which appears white on the positive print), ten of the legs (hence the name Decadog), omitting the second last paw on the left. You may be asking—how did this dog exist in Kingston? Easy enough answer is that the photograph was taken by a panoramic camera also known as a Cirkut. The Cirkut is a rotating camera that would capture a panoramic scene by pivoting horizontally while a roll of film moved across the film plane. At just the right moment, the dog must have walked as the camera was rotating from left to right. Consequently, the slow capture could capture the slow movement of the dog walking across the plane of view. To prove that this Decadog is a “normal” four-legged friend, I have included an additional nitrate panorama from our collection. This time it is from the 8th Draft “C” Battery, RCHA, CEF, Petawawa Camp on June 1916. From his face markings, we think that this is the same dog in both nitrate panoramas. Tania Passafiume has been the Head Conservator of Photographic Materials for Library and Archives Canada since 2005. After graduating from Queen’s University with a Master’s in Art Conservation (specializing in photographs, works on paper and book conservation), she moved to Rochester, New York. It was in Rochester at the George Eastman House where she remained for over three years, first participating in the Certificate Program in Photographic Preservation and Archival Practice and then as a Fellow in the first cycle of the Andrew W. Mellon Fellow in the Advanced Residency Program in Photograph Conservation. For the following three years, Tania was an Andrew W. Mellon Fellow, in Photographic Conservation at the Art Institute of Chicago. 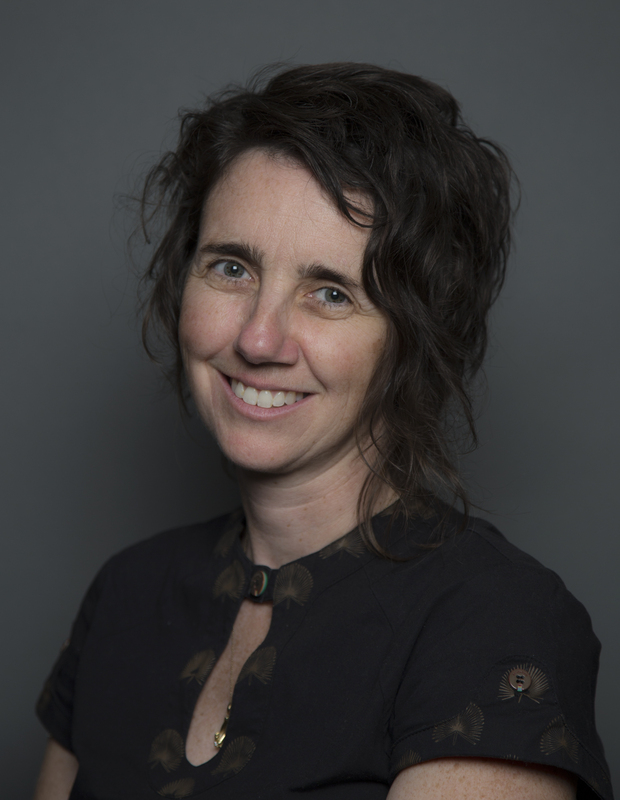 Tania has also worked in the following institutions and private labs: Jana Conservation, McMichael Canadian Art Collection, National Archives of Canada, City of Vancouver Archives, and Canadian Centre for Architecture. With the Canadian Conservation Institute she has published “Silver Gelatin Paper Sample Sets,” which is based on her George Eastman House thesis. Also stemming from this was research on Hippolyte Bayard, a topic on which she is currently working with the Centre de recherché sur la conservation des collections (CRCC), Paris. More recently, she spearheaded a LAC project with the Cultural Affairs Department of the City of Paris/Atelier de Restauration et de Conservation des Photographies de la Ville de Paris (ARCP) in a collaboration to create the first English-French visual glossary of photo conservation terms in enhanced eBook format called Lingua Franca: A Common Language for Conservators of Photographic Materials which will soon be available for free on iTunes. 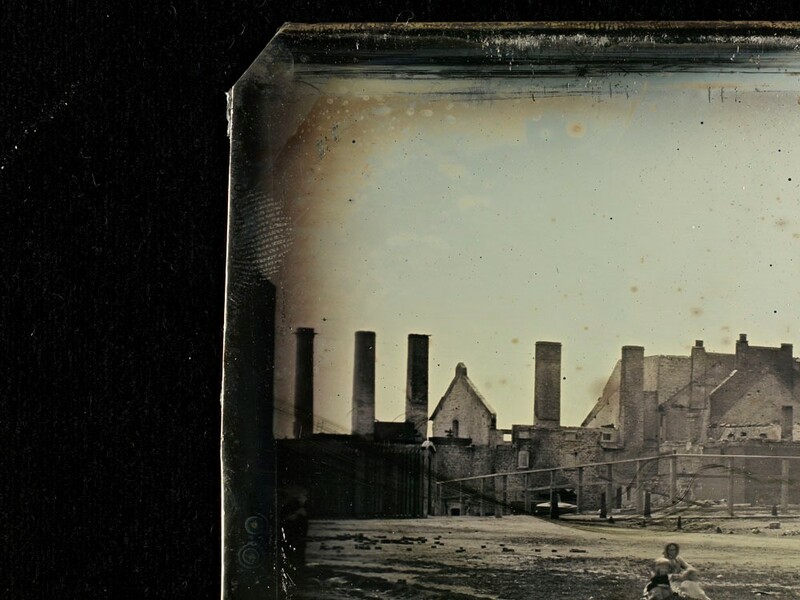 Depending on conditions, the rates of deterioration of the materials that make up a daguerreotype package (e.g., copper, silver, paper, brass, leather, velvet, silk and glass) can vary substantially. One of the most common problems found by conservators is glass deterioration. Glass deterioration can occur as a result of fluctuations in either temperature or humidity. There are a couple of ways in which this type of degradation can manifest itself. One is cracking, which is when tiny hairline cracks appear on the surface of the glass. The other is chemical decomposition, which affects older glass with a higher concentration of sodium oxide, causing the glass to appear hazy or cloudy. The Daguerreotype, a one-of-a-kind photograph, was largely produced between 1839 and 1864. It was the first publicly-available photographic process and was renowned for its image detail and clarity. The photographs are highly susceptible to image loss, corrosion build-up and other forms of deterioration caused by poor handling and environmental exposure. To protect the image, the photographic plate was delicately placed under glass, from which it was separated by a protective mat. This assembly was then hermetically sealed using paper tape and covered with a brass foil called a “preserver”. 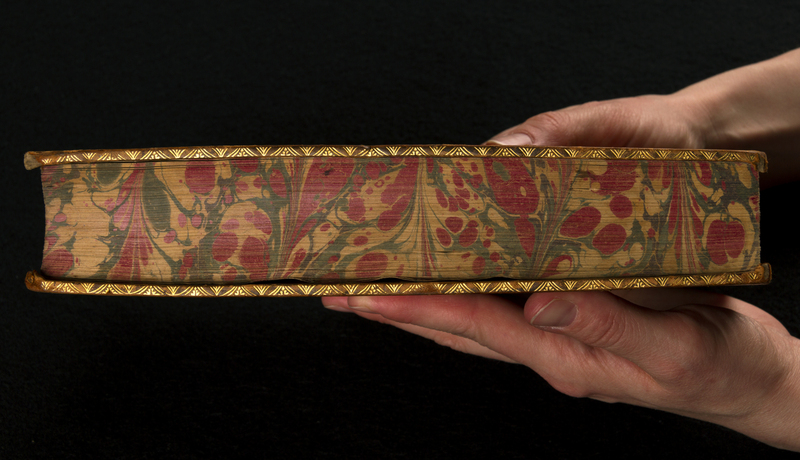 The entire package was housed in a small, often decorative, case made of leather, wood, papier mâché or moulded plastic, with an interior lining of silk or velvet. Makers’ marks, known as hallmarks or plate marks are stamped markings found on many, but not all, daguerreotypes. When they are present, they are often found on the edge of the plate and are, thus, invisible when the daguerreotype is sealed. Marks typically consist of initials, symbols and numbers. The number most commonly found is “40”, which refers to the physical makeup of the plate, 1 part silver to 39 parts copper. Plate marks can offer clues about where the copper plate was manufactured and where the photographer sourced materials. They can sometimes also help to date an image. Access is a key part of Library and Archives Canada’s mandate. Staff strive to provide access to original material whenever possible, but what happens when material has been removed from circulation and you need to consult the original? When you request material that has been removed from circulation, a staff member from the consultation desk will contact a Collection Manager or Holdings Management Assistant and inform them that a researcher wishes to consult originals and provide the reason the researcher needs to view them. The Collection Manager or Holdings Management Assistant will assess the requested material and determine whether the material can safely travel to 395 Wellington for consultation. Textual material ready to be assessed. If the material is considered to be too fragile or exceptionally valuable, the Collection Manager will stipulate that supervised consultation is required. Library and Archives Canada staff do their best to facilitate access but in some cases material simply cannot travel. When this happens, you have the option of setting up an appointment to view the originals at the Preservation Center in Gatineau under the supervision of a reference archivist and a member of the Holdings Management team. Library and Archives Canada (LAC) receives a wide range of published heritage material through legal deposit, such as books, periodicals, government publications, etc. 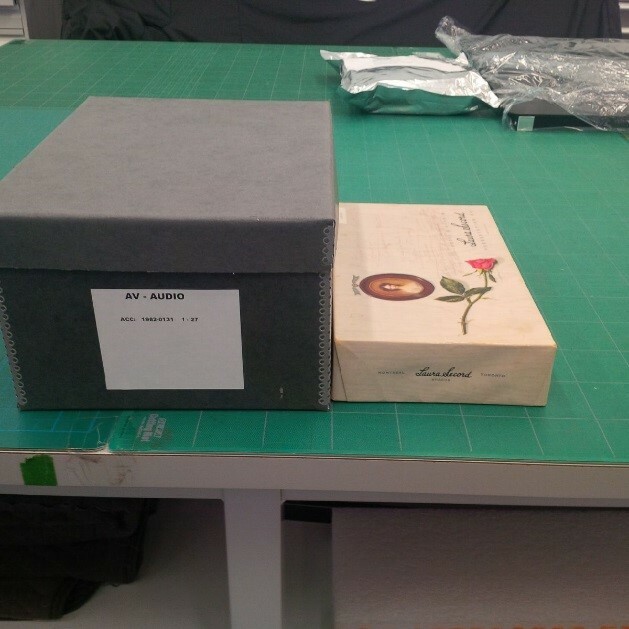 Occasionally LAC receives multimedia kits that must be re-boxed by the Preservation Services Unit. Multimedia kits contain more than books, but all items still need to be stored together, as much as possible. A good example of a multimedia item would be an educational kit designed for use in schools. A kit may include bound textbooks, binders with loose-leaf pages, posters, pamphlets, CDs and DVDs. Older kits may include items such as cassette tapes, slides, video tapes, and film strips—the popular media used when the kit was published. A custom-made container and spacers are constructed for each kit to keep the components together for research purposes and to secure the different-sized items in the box. The container also provides protection from environmental harm such as light or water damage. 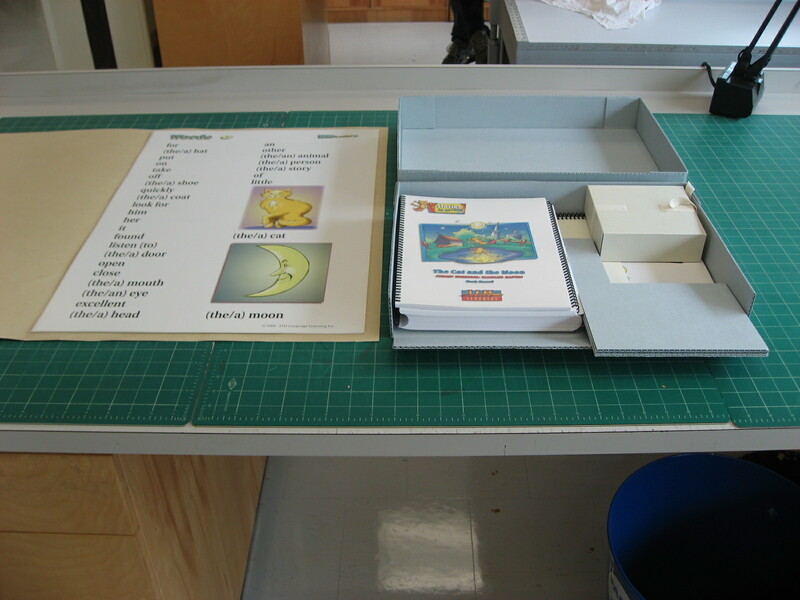 An example of the components of a multimedia educational kit. 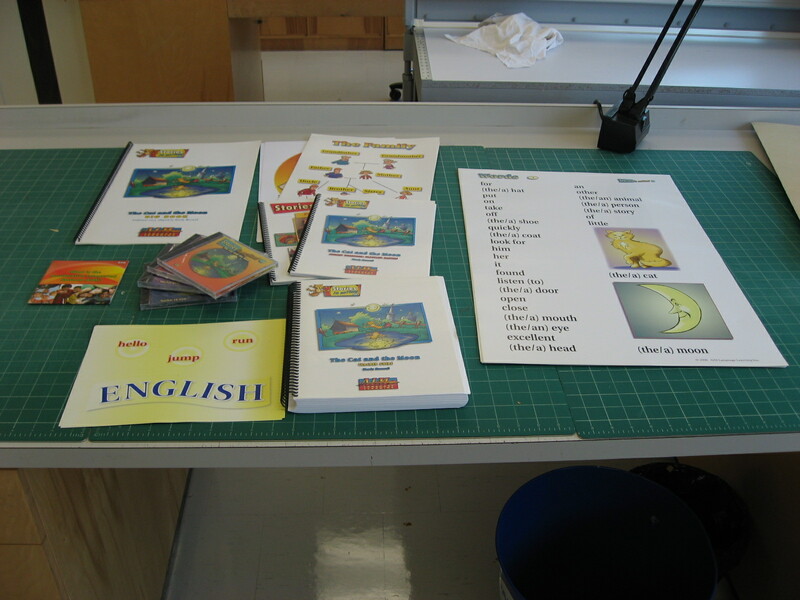 Sample of a custom folder for a poster and box created for a multimedia educational kit. 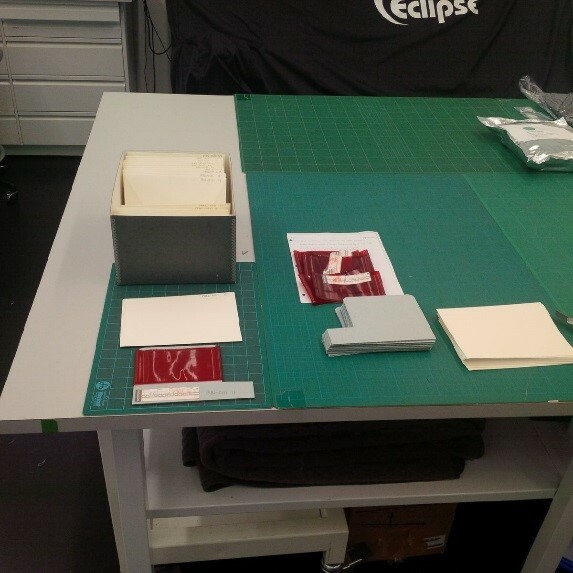 All the items in the multimedia kit have their own space, making it ideal for access and preservation. Large rolled posters are flattened, placed in a custom folder, and filed in a flat storage drawer. A separate box for CDs and DVDs is constructed and held in place with a custom spacer so that they don’t shift when the box is moved. All materials used in the construction of these containers are archival quality so they are acid-free and meet strict standards for material composition and longevity. This is another example of how the Collection Management Division ensures the preservation of collection items through the skills, craftsmanship, and dedication of its staff. Chris Smith, Library and Archives Canada Collections Management Clerk, was recently assigned an interesting and challenging rehousing project. Chris found himself looking at a Laura Secord chocolate box filled with not sweets, but a tangled mess of Dictaphone belts: 27 in total. Introduced by the Dictaphone Corporation in the 1940s, the Dictabelt was a voice recording system using a thin plastic belt. The Dictabelt Re-Recording Service describes how the recordings worked: audio could be impressed onto the belt utilizing a needle-type stylus to emboss or plough a groove into the soft plastic. They were predominately employed for business, medical and scientific recordings. 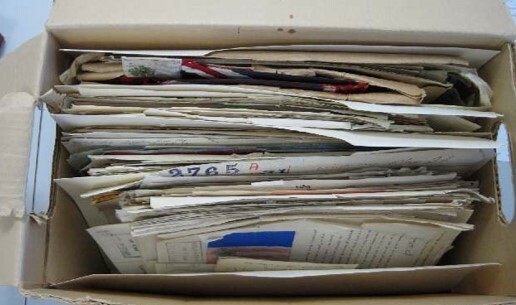 After use, Dictabelts were usually stored flat in boxes or file folders. This caused creasing and damage to the recordings. Following considerable research on Dictabelt preservation techniques and consultation with our audiovisual conservation experts, Chris began his rehousing process. He wrapped each belt around a piece of custom-cut acid-free board to reduce creasing. Chris then placed each wrapped belt in an envelope, built spacers, and rehoused all 27 belts. They now safely reside in an 18C and 40% relative humidity (RH) environment at our Preservation Centre. This photo demonstrates the steps required for properly housing Dictaphone belts for long-term preservation. The Laura Secord box beside the new enclosure. Now the dictaphone belts will no longer be at risk. The near-surgical precision in all this rehousing work is most impressive, and plays a vital role in our preservation activities. Well done, Chris! 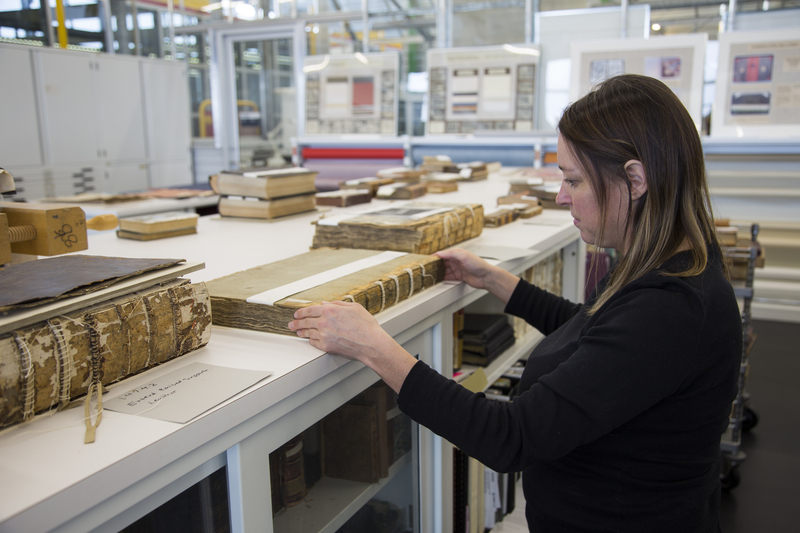 Collection Managers at Library and Archives Canada (LAC) frequently receive questions related to the preservation of a variety of objects. In addition, whenever we offer in-house training sessions to staff, we also like to include information about references and further reading. We thought we’d share some of our go-to online resources, as it can be hard to sift through all the information out there. These, in our opinion, are trusted sources that keep up to date with changing information and best practices that reflect scientific developments. They generally include source references as well, such as suppliers and bibliographies. Please note: Invasive treatment should not be attempted without conservation training in the relevant medium. While anyone who can wield a knife and a straightedge can successfully make protective enclosures, if actual repair work is called for, please consult a conservator. These sites provide information on a variety of media. We recommend you consult the indexes to see if what you’re looking for is included. CCI’s site has preservation information on a variety of objects including books, paper, photos, musical instruments and outdoor art. CCQ’s site hosts Preserv’Art, a database of acceptable materials. It is a great source of information about supplies that are safe to use with particular media/objects. Note also that it contains info about what is NOT safe, which can be very useful as well. NEDCC’s series of Preservation Leaflets is also an excellent source of information. These publications are continually reviewed and updated as necessary. The United States’ NPS has an extensive series of Conserve O Grams, which are excellent publications on a variety of topics. While geared more toward the museum professional, they can still be useful sources of information about a range of subjects such as protective enclosures. Of particular interest are the new Conserve O Grams on the creation, care and storage of digital materials.